Japanese tsutsugaki folk textiles are renowned for their bold, traditional, auspicious and life-affirming pictorial motifs. Throughout rural Japan, tsutsugaki pieces were made by commoners for use by their fellow commoners. Rural folk commissioned tsutsugaki craftsmen to create depictions of dramatic and propitious motifs on indigo resist-paste dyed cotton or hemp cloth as a way of conveying unspoken meaning and significance to important life, religious and cultural celebrations. The tsutsugaki craftsman was an unnamed artist who didn’t sign his work, and neither did he strive for an ideal composition as compared to an artist of the classical genteel visual arts. Today, the Japanese consider the historic tsutsugaki artisan a unique mingei craftsman, a maker of imperfect handmade country crafts for ordinary use. The word mingei was coined by Soetsu Yanagi, founder of The Japan Folkcraft Museum, in the 1920s. He recognized the remarkable arts-and-crafts body of work of a variety of unpretentious craftsmen residing in rural communities who created unsigned craftwork of functional beauty. 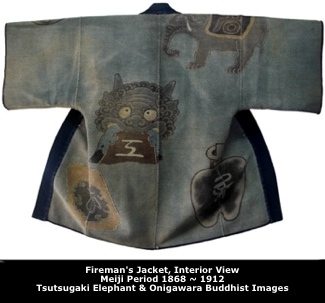 Early tsutsugaki textiles produced before 1600 were meant specifically for military, religious and communal purposes. 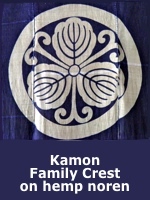 For example, samurai commanders flew tsutsugaki war banners or flags with clan crests (kamon) during battles in order to distinguish friend from foe. Additionally, tsutsugaki memorial banners and flags held an important position in Buddhist temple and Shinto shrine ceremonial events: birth, marriage (Shinto) and death (Buddhist). 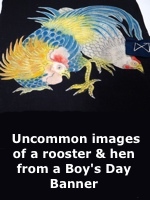 One of the oldest tsutsugaki textiles in existence is a kyogen drama entertainer’s hemp costume with a two-umbrella motif from the 16th century which is currently housed in the Tokyo National Museum. 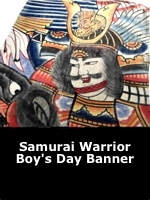 Innovative resist-paste dye techniques in Japan date back to the Nara period (645-794). Early application of the tsutsugaki dyeing technique employed fabrics common to the era, including hemp, ramie and other fibrous plants that were distinct to a particular Japanese sub-climate and easily available to ordinary people. These bast fiber plants provided the only domestic fiber for use by villagers and other common folks before the introduction of cotton into Japan from China in the late 1400s. By the middle 1600s, cotton farming and its subsequent textile production became firmly rooted in the southern regions of the Japanese archipelago. As cotton cultivation increased and cotton cloth became more widely available through the encouragement and support of the ruling shogunates, it rapidly replaced hemp and the other bast fibers as the primary material of everyday dress and household textiles. Cotton held the advantage of being warmer and more comfortable, and became less expensive and quicker to produce than the hitherto customary bast fiber fabrics. The relative speed at which raw cotton was transformed into fabric meant that homemakers were able to produce more cloth than was necessary for their family’s use. This allowed females to make supplemental income by the sale of their domestic labor to outsiders. The result was the birth of a cotton fabrication cottage industry. The spread of cotton cultivation, along with thriving Japanese spinning and weaving cottage industries, gave rise to a flourishing tsutsugaki textile folkcraft industry. These deep blue indigo textiles with motifs that proclaimed notable family occasions found a presence in the homes of the urban affluent, and then in due course became commonplace among ordinary people throughout Japan’s impoverished rural districts. Tsutsugaki is a freehand dyeing method. 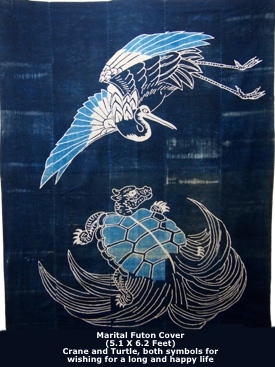 The tsutsugaki paste-resist dyeing technique produced a one-of-a-kind textile design with indigo as the predominant color. A tsutsugaki craftsman outlined a design by squeezing a rice resist-paste mixture through a cone shaped sturdy washi paper tube onto white cotton or natural hemp fabric. 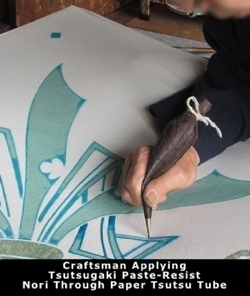 The artisan applied a mirror image pattern of the paste on both sides of the cloth. Then the fabric was submerged into a vat of indigo dye. After removing the textile from the vat, it was thoroughly dried and the resist-paste was washed off in water. The beginnings of the craftsman’s creation became abundantly evident. After the initial dyeing, additional resist-paste was applied in order to bring about more details to the overall design. Then, once again, the cloth was immersed into the vat where the paste-resist covered areas remained untouched by the dye. After the indigo tinted the fabric and the design revealed itself to the craftsman’s satisfaction, the fabric went through a final washing in order to remove the remaining resist-paste. The maker would then finalize the motif by hand inking the ultimate design details with a brush. The artisan would normally employ different shades of indigo to colorize the fabric, but for singular creations, he would add colorful dyes in order to give the textile’s motif a more joyous and lively appearance. Japanese textile craftsmen found that cotton was a difficult fabric to dye except with indigo; as a result, deep blue became the principal base color for ordinary textiles. Research has discovered that natural indigo dye was used in Japan as far back as the 5th century. At that time, it competed for popularity with red and brown madder dyes which were used to color all sorts of objects. The use of blue for fabrics was restricted by edict for use by the upper classes until the dawn of the Edo period and the subsequent corresponding proliferation of cotton as an everyday cloth for fashioning clothing and household textiles. Lord Hachisuka Lemasa, daimyo of Shikoku Island, expanded the Japanese vegetable indigo dye industry through his development of innovative indigo dye fabrication techniques. Shikoku became the indigo dye manufacturing center for the Japanese textile industry. When one casually gazes upon a hanging tsutsugaki futon cover, it appears to be a single cloth. But, upon closer inspection one finds that it is actually composed of four or five separate panels, each about 13 inches (34 cm) wide, which have been hand-sewn together. In order to form the whole textile, each of the fabric panels was individually dyed by the tsutsugaki technique and then stitched together, keeping the side-by-side pattern registration as close to matching as possible. Tsutsugaki textile designs emanated from the Japanese spiritual relationship with nature. This mystical connection was enhanced and embellished with symbols rooted in Japanese myths, culture, and Buddhist concepts. 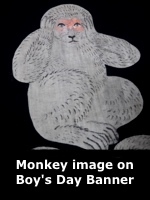 Chinese and Japanese images of flora and fauna were also popular images. 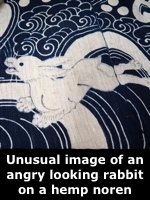 The Japanese believed that these traditional symbolic metaphors protected the home and family from unexpected harm. During the heyday of tsutsugaki-designed textiles, the Japanese felt threatened by what they believed to be supernatural forces that could destroy at whim their lives and habitats (earthquakes, tsunamis and the like). They felt helpless to control nature by themselves alone. As reflected in the mythological designs found on many tsutsugaki textiles, the Japanese appealed to Buddhist deities and Shinto kami (gods) for their family’s safe keeping and future happiness. 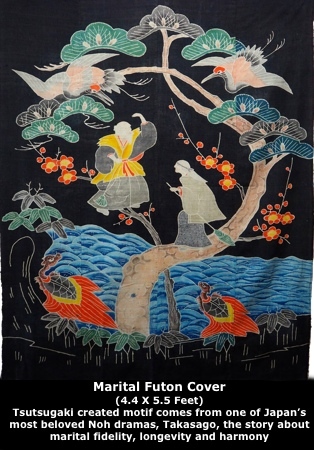 Some of the more common allegorical visual elements present on tsutsugaki textiles include cranes, turtles, Buddhist images, cherry and plum blossoms, pine trees, Noh play fables, mythical and historic samurai warriors, the kamon family crest and other virtuous metaphors. Due to the rapid modernization of the Japanese textile industry by the beginning of the Showa Period (1926–1989), traditional tsutsugaki textile creation came to a sudden halt. Today, only a handful of highly skilled craftsmen continue to apply their entrusted artistry at making delightful tsutsugaki textiles. These few men are now highly valued in Japanese society for their dedicated preservation of an original Japanese mingei folkcraft. And, they are the last remaining artisans of what was an ubiquitous folkcraft which held an important cultural and indispensable position in Japanese society. Fair Use Policy: Anyone for any purpose may copy and reuse/republish this site's written content and photos by including a link back reference (required) to this page or our site's front page. Note: Share my images on your own web page by uploading them to your own server, please don't link to them from this site.